In my profession sharing my knowledge and passion of art with others is commonplace. 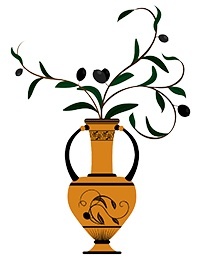 However there are those times of sharing that stand out, and it was this morning in reflection of a recent visit to the Getty center with students that spurred this writing. 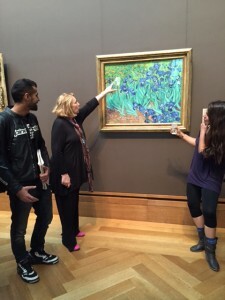 I had just read a note from a student about the visit that stated, “it was incredible…a wonderful experience…” The majority of the students who visited the museum with me last week had never been to the Getty. This rather small group seemed to be actually listening to my every word and enjoying each encounter with a painting and the architecture. A museum of that size can be very overwhelming to some, and it is difficult to know where or what to look at first. I narrow it down to a few works of each genre, a few from each historical period. Each turn of a corner offers something new and an opportunity for me to share with them in a special way that one can only do right in front of the actual works of art. This then led me back to a most wonderful experience last December at the San Diego Museum of Art where my 5 year old grandson excitedly guided me through the exhibition “Gauguin to Warhol: 20th Century Icons from the Albright-Knox Art Gallery.” He had seen the exhibit before and was anxious to show it to me. He took my hand and pointed out things to me in the Chagalls, Matisses, and Van Goghs that he liked. And I pointed out things to him. His comment on a Dali left me in stitches—“Nana, it looks like a rag on a rock…” –-and I explained how some artists like to paint things from their dreams. He pointed to the colors he liked in some paintings. I showed him one of my favorites, Rothko, and he said he could paint it because it was just colors. Then there was a painting from Motherwell’s series Elegy of the Spanish Republic (see photo above). There we were and I had just explained to him how some artists express themselves with just shapes and colors, and that if we just stop and look for a while we can enjoy it without there being a house or tree or person that we can recognize. The photograph says it all, he is contemplating the Motherwell painting. When we returned home, he began creating his own gallery with drawings of houses and trees, recalling a certain Gauguin or Chagall. A gallery with scotch-taped works of art, that is continually growing, now lines the wall of my son’s family room, a place where art can be shared by all. My week culminated with another type of art sharing, this time at the Norton Simon Museum in Pasadena. I am referring to the viewing of the exhibit entitled “Tête-à-tête: Three Masterpieces from the Musée d’Orsay.” Along with some close friends who also happen to be artists and art historians, I went to see 3 important paintings on loan from a favorite museum. Whistler’s Arrangement in Gray and Black, no. 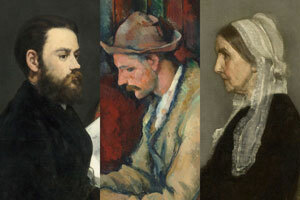 1 (1871), famously known as Whistler’s Mother, Manet’s Portrait of Emile Zola (1868), and Cezanne’s The Card Players (1892-6) carefully hung in a gallery with other 19th century selections from the Norton Simon collection. We looked, we talked, we discussed, and we talked some more and of course our commentary can be a bit complex due to the knowledge we have in tow. There is something about this kind of viewing experience that is unique as we have all seen these paintings before in their original home, studied them, taught them, and now we have the opportunity to share our experiences and views, opinions, with each other in a new way. This is a treasured type of sharing of art for me, one that cannot be duplicated. In life, it is the moments after all that we cherish. Many of my moments lie in the pleasures of the visual world, in sharing my knowledge, my enjoyment, my wonderment with others. I hope that those who share those experiences with me will treasure them as I do. I am certain you have similar stories of sharing moments with others. Please do share. I love this blog entry. Keep ’em coming! Wonderful! Wish I was there! 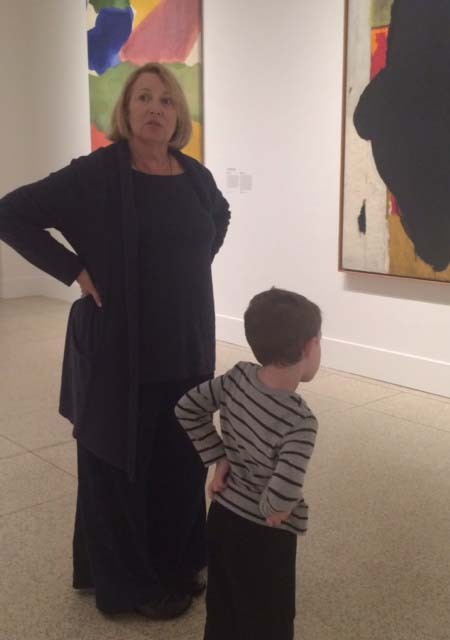 I loved this, especially what your grandson said about the Rothko painting 🙂 !